Meet NCVPS Super Student Austin B. 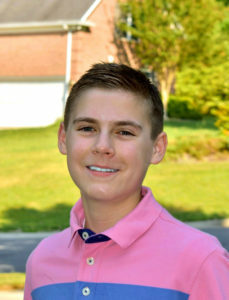 North Carolina Virtual Public School > News > Super Students > Meet NCVPS Super Student Austin B.
NCVPS Super Student Austin B. “My future plans are to attend the Levine Middle College High School Program and graduate high school with enough credits to earn my Associates degree at the same time. I would like to graduate from college and work in either the medical or science field, which both greatly interest me. The ideal would be to do all of while serving Jesus at the center.” –-Austin B.
I have had a great experience with NCVPS that is unlike any other virtual school. NCVPS has allowed me to look forward to doing school in the morning and empowers me to reach my full academic potential. Taking online courses with NCVPS has advanced my education by allowing me to absorb the information that I am learning in a time frame that is perfect for me. Unlike a traditional school, I do not have to spend a full 90 minutes going over the same topic if I have already mastered it. I can also absorb much more information in my studies as I do not have nearly as many distractions as a traditional school environment. My advice for other online students is to find a school routine that works for you. Once you find your rhythm, it becomes so much easier to get started with your work and complete it on schedule. Some of my favorite internet sites are actually ones that I learned about in school. The first is called Earth Nullschool, which I learned about in 9th grade Honors Earth and Environmental Science. It is a website that allows anyone around the globe to see the current wind, weather, ocean, and pollution conditions, as forecasted by supercomputers; the information is all displayed on an interactive animated map. I love to play with the different overlay and mode options and see what different parts of the world are experiencing in the present. Another website that I visit a lot is Youtube. Because, I mean cmon, there’s a video for practically everyone on Youtube. I like to listen to Christian music and broaden my understanding of real-world advancements. Some of my favorite pieces of technology are most all items found on the “top tech gifts” section of Best Buy’s website. I like to see the new phone technology that emerges each year as well as wearable devices such as the new Fitbit. Another kind of technology that really interests me are the new medical and scientific innovations that are created to better the lives of others. I love to learn about new technology that simplifies everyday tasks and medical devices that can help someone live longer or even save their life. This semester, I had the goal of finding new extracurricular activities outside of school. I have found many serving opportunities am involved in playing tennis a few nights a week. My favorite season is fall because of the beautiful scenery and perfect temperatures. I have also traveled to many places in and out of the country and love seeing God’s creation throughout it. I like to read both fiction and non-fiction books and love an underdog story. Some books that I really like are The Boys in the Boat and the Bible. Each of these books tells meaningful story’s that teach very important lessons. Some of my favorite music to listen to is Worship by Elevation Church and Hillsong Young and Free. I enjoy listening to their songs and love the lyrics. One of my favorite movies is Hidden Figures because the message that it shares and the fantastic storyline! I love to play a good game of tennis and am a strong believer in the Lord. I am thankful for the blessings of a great family and caring parents that have taught me about the love and grace of Jesus Christ.